When you do your laundry, chances are that you don’t spend much time thinking about how your dryer works. But having a general idea of the mechanics behind your dryer can go a long way toward helping you spot issues before they become a major problem. When you put your clothes in the dryer, hot air is used to blow past the clothes and start an evaporation process. This water vapor leaves the machine through your dryer vent. But because the water vapor is moist, it also carries lint along with it, which starts to accumulate in the exhaust duct. This can lead to significantly reduced efficiency in drying your clothes, causing higher utility bills and greatly increasing the risk of fire. It’s important to hire a reputable HVAC contractor like Real Clean Air in Montgomery County, MD, for professional dryer vent cleaning and inspection on a regular basis. Proper cleaning and maintenance ensures that the vents are clear, reducing the risk of house fire and dangerous carbon monoxide backup that puts you and your family at risk of serious illness or even death. It’s advised to have your dryer vent cleaned and inspected at least once a year. After all, you wouldn’t want to experience a house fire and find out after the fact that it could have been prevented. The average dryer vent cleaning cost ranges from $75 to $100 depending on factors such as accessibility and accumulation. 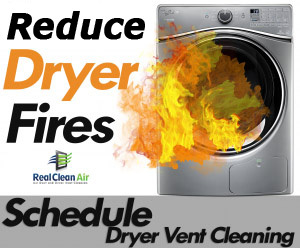 Give us a call today for a free comprehensive estimate to discover our affordable dryer vent cleaning costs. It’s tempting for homeowners for undertake dryer vent cleaning on themselves, but it needs to be said that this is not a DIY project. In order to ensure the job is thoroughly and successfully completed, it’s essential to call a professional service like Real Clean Air that has the proper training and equipment for a job well done. A leaf blower or similar tool doesn’t have the power required to remove debris in its entirety. Our techs are able to clean all types of dryer vents, including ones that go through the roof. When you trust Real Clean Air in Montgomery County, MD, you’re investing in the safety of your home and loved ones at rates that won’t break the bank. Copyright © 2018 Real Clean Air. All Rights Reserved. Real Clean Air is located in Washington DC and provides duct cleaning services in Washington DC and counties throughout Maryland and Virginia.